Flavor: Cough syrup. Cough syrup smell and cough syrup taste. I can’t taste anything else. If you like drinking cough syrup you would love this. Conclusion: How can I say this nicely? Nope, I can’t. This stuff is just bad. I can usually find some redeeming qualities with a root beer. Not so here. 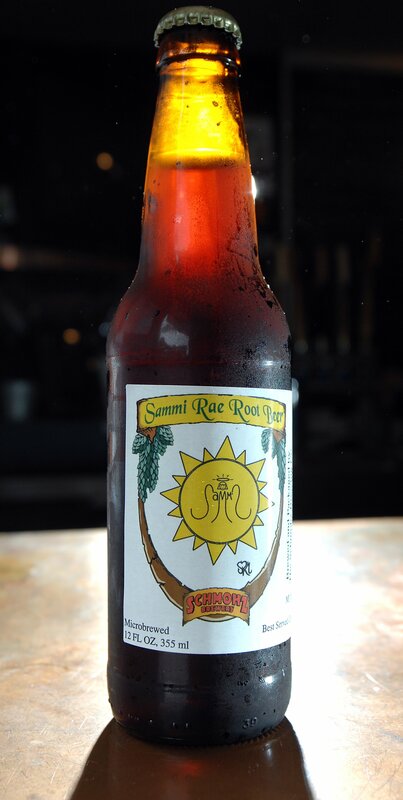 Sammi Rae Root Beer does have a good mouth feel and nice foamy head but in the all important flavor department it is downright awful. If you enjoy the taste of cough syrup this brew should be on your short list. Smell: Very strong medicinal smell from the bottle. Very much like cough syrup. When poured the medicinal smell persists and also a strong wintergreen smell. Carbonation: I tried really hard to notice the carbonation but it was really difficult because the flavor completely overwhelmed my mouth. I’d say this has a low level of carbonation with just a bit of bite. Head: A nice foamy head that is tall and long lasting. It nearly went over the top of my frosty mug when I poured it and it lasted for a good minute or so before dissipating down to the level of the root beer. Flavor: Remember that cough syrup smell? Yeah, that’s also what it tastes like. Cough syrup is the only way to describe it. Conclusion: Do you like the flavor of cough syrup? Do you drink cough syrup with your meals? Then go out and buy this root beer right now. If you think cough syrup is a disgusting invention of Satan then avoid this root beer like the plague. I’m not usually this harsh but this root beer is terrible. My wife, who often has different tastes in root been than myself, also agrees. Flavor: Odd. It is kind of fruity with a much stronger cream soda vibe than root beer. Also, it tastes fruity and has a pretty strong medicinal aftertaste. 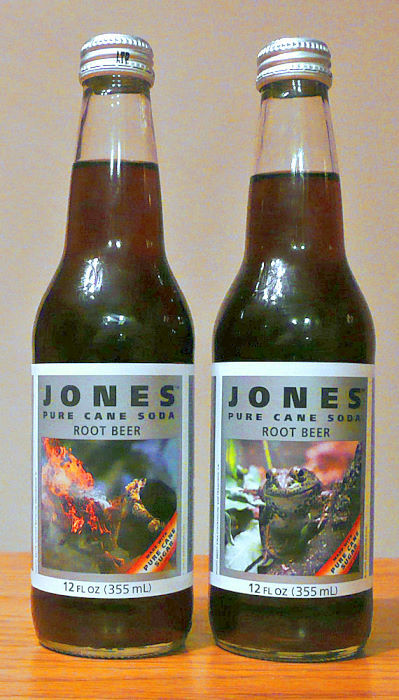 Conclusion: I gave my wife a sip of this Jones Pure Cane Soda Root Beer while I was writing this review and she said, “That’s not root beer.” I agree. It really does not taste like root beer. Most root beers have at least some commonality in the flavor department. Maybe it’s the the licorice or wintergreen undertones that tie so many brews together. This brew just seems to be doing its own thing and still claiming the root beer label. If you want to try something different, give this a go. If you like your root beer to at least resemble root beer, I recommend spending your hard earned dough on something else. Flavor: The only word I can think to describe the flavor is “odd.” It is slightly medicinal but lacks the traditional licorice and wintergreen elements that are usually found to some degree in most root beers. In fact, this tastes more like a bad Coke knock off than root beer. Conclusion: So Duh! Rockin’ Root Beer is decidedly not “rockin’.” This is perhaps the most un-root beer root beer I have tasted yet. It has a great smell, but the flavor totally misses the mark. The more I drank of it, the more convinced I became that it reminded me of a Coke knock off. It’s a shame because I was hoping for something more with the name of this brew. Flavor: Straight up cough syrup. Maybe the “artificial color” is what makes root beer taste like root beer (not) and they need to use it. Very medicinal and even a bit fruity. This is not grape pop. It’s not supposed to be fruity. Conclusion: Can Rugged Mountain Root Beer even be called root beer? I guess going “all natural” in this case does not yield pleasing results. I’ve had another “all natural” brew (Maine Root) and it was quite tasty. This one is simply not good at all. I see nothing redeeming about this brew. I don’t hand my lowest grade very often, but this brew certainly earns it. Conclusion: This is one of the strangest tasting root beers I have encountered. It is really like there is no flavor to it other than the aftertaste. Unfortunately, the aftertaste is not enjoyable at all. I don’t hand out the “F” grade very often, but I see little to redeem this brew from its abject failure in the taste department. Unless you like oddly medicinal flavored root beers, I suggest avoiding Cool Mountain Root Beer. Bottle and Label: A very well designed and classy label make this look like a sophisticated brew even when it is just sitting on the shelf. The bottle is a simple dark brown color. Smell: From the bottle this brew has a mild smell that lacks the traditional licorice and wintergreen and instead smells a bit medicinal. It maintains the medicinal smell after being poured. Bottle and Label: Clear bottle and blue label make it easy to distinguish on a shelf crowded with brown bottles and labels. Ingredients: Carbonated water, high fructose corn syrup and/or sucrose, caramel color, sodium benzoate, citric acid, caffeine, artificial and natural flavors, acacia. Smell: Smell is weak and it is difficult to distinguish any noticeable characteristics. There seems to be a bit of wintergreen smell, but it is very weak. Carbonation: Very little carbonation leaves this brew tasting flat. Color: Pleasing, dark brown color that is slightly transparent. Flavor: Barq’s root beer has a very mainstream flavor in that it is hard to find much in it to really savor. Much like the carbonation, the flavor is flat and leaves a slightly metallic aftertaste. There is not much else to say. Barq’s simply misses the mark in the flavor department. Conclusion: Barq’s is one of those brews I drank as a kid when my parents would occasionally buy cases of it to drink on hot summer days on the farm. As a kid on a hot day, Barq’s was just fine. Well, times have changed. Barq’s is a mainstream root beer, but it falls short of my standard mainstream root beer, A&W. A&W, despite being largely artificial, still tastes pretty good. Barq’s is simply bland and has no redeeming qualities. This is one brew where I can, without hesitation, say avoid this beverage. Bottle and Label: Brown bottle with a nicely designed label featuring a popular Route 66 landmark in Oklahoma. Ingredients: Carbonated water, high fructose corn syrup, caramel color, citric acid, natural and artificial flavor, and sodium benzoate as a preservative. Smell: As much as I tried, I could not distinguish any smell at all from the bottle. After pouring in my frosted mug, I still could not detect any smell other than something that was a bit like dirt. Carbonation: Medium level of carbonation with a nice bite. Color: One of the lightest brews that I have seen. It is transparent even when it is not held up to the light. Still, it is a pleasing dark amber color. Head: Short head, not too foamy, but it lasts for a good while. Flavor: I think this is the first brew that I have truly not wanted to taste again after the first sip. The brew has an odd aftertaste that reminds me of dirt. The aftertaste lingers long after the beverage is swallowed. I taste very little in terms of the traditional flavors that make a root beer. If those flavors are present, they are overpowered by the taste of dirt. Conclusion: I have posted in the past how fond I am of Pop’s. It is a great store with a good restaurant and an awesome selection of pops from around the world. Unfortunately, whoever thought up the recipe for their signature root beer needs to be taken out back to the woodshed until they repent of this travesty. Round Barn Root Beer earns the dubious distinction of being the very first root beer I have reviewed to have no redeeming qualities. You read that right, I see nothing good about this brew. Avoid this root beer at all costs. If you come across it, buy some A&W Root Beer instead, at least then you will have something to drink that resembles actual root beer.